A beautifully furnished and equipped property, Stanley House has wireless internet access and inclusive heating for year round use. Location for the popular Doc Martin TV series, Port Isaac is an excellent location for coastal walks, close to excellent surfing beaches two golf courses and Daymer Bay, perfect for family days on the beach. A wide range of excellent pubs and restaurants are within easy strolling distance. My husband and I live and work in the Cotswolds and have two teenage daughters. We discovered Port Isaac when we were on our honeymoon twenty years ago and fell in love with it then. We have been coming back ever since. Now that Doc Martin has put Port Isaac on the map we are delighted that more people are coming to enjoy this special location. We get a kick out of seeing our front door on camera. Port Isaac is also home to the now famous Fishermen's Friends singers and we take pleasure in seeing them perform on the Platt every Friday evening from 8 p.m. during the summer months. When the opportunity came up to buy the apartment in 2006 we jumped at the chance because it is perfectly positioned in the centre of the village. Over the next eighteen months we undertook extensive renovations to turn it into a comfortable, high spec home from home. We try to get down there as often as possible as we love the surrounding area, walking the coastal path and visiting some of the glorious North Cornwall beaches. We hope you will like it as much as we do. What we enjoy most about the apartment is the open feel to the sitting room where you can sit and watch the world go by from the window. When you are cooking you are still all together which makes it a great entertainment space. We also like to be able to wander from the front door and have a choice of places to eat right on our doorstep. The lounge/dining room is open plan to the kitchen with an electric fire, flat screen TV and CD player with plenty of books and games. Excellent golf available at St Kew (5 minutes by car) and the beautiful St Enodoc (approximately 10 minutes away). Notes on accommodation: It is possible to park outside to load and unload. Parking is available on the beach at low tide and in the public car park or on the street about 5 minutes walk away. No smoking. Storage heaters and oil filled radiators throughout. Outside: Outside there is a area to hang laundry. Utility Room: There is a washing machine integrated in the airing cupboard and a iron and ironing board. Cleaning / Towels / Linen / Maid service: Towels and bed linen are included and the property is cleaned before and after your stay. Please bring your own beach towels. We had a wonderful time at number 22 and cannot wait to go back. Fabulous location in the heart of Port Isaac with everything on your doorstep. Elaine was a brilliant host and answered questions in minutes. We will for sure be back to this fully equipped house, home from home. Apartment in a great location, but generally quite tired and jaded. Quirky apartment in a great location could be great with a new bathroom and overall refurb. General cleanliness could be better although bedding and towels nice. No hanging space for clothes and general storage limited. Bedrooms small but comfy. Great to walk a few steps to the pub and pasty shop! Quaint, in central location. Key collecting system efficient. Port Isaac offers inconvenient options for public car park. The property is probably apt for 4 adults and two children. Sanitation facilities all being in 1 room was inconvenient for 6 and needs updating. Linen and all surfaces spotless. 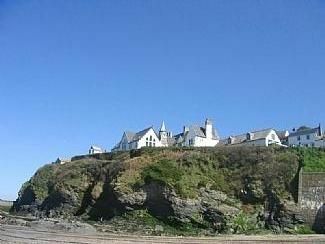 Once over our disappointment of the image of the house on the cliff top NOT being of this property, we enjoyed our stay. Be aware of the nightly prowler (cat) in the upstairs bedroom. Great home from home property and really useful parking outside for off load/ load, particularly shopping . Seconds from harbour . Handy pasties shop next door that sells essentials ... milk bread etc. Good size TV and Netflix to keep kids happy in the evening! Will definitely book again. We had a great time staying at this property over the new year 2017/18. It was very clean and comfortable and well equipped. I would definately recommend this property. The only thing I would say is that there is a definite lack of hanging space for clothes but also to try towels, washing etc. This is primarily down to the shape of the rooms but would be worth considering options to address this. The drawers in the fridge were broken and the plug for the dishwasher didn't work (we got around this by using the extension lead to use an alternative plug) but these were the only snags. Fantastic location. Warm, tastefully decorated and deceptively large! We had a fantastic holiday in Port Isaac. The cottages location was perfect for pottering to the beach, shops and watching the world go by. I would highly recommend this place! The beach is thirty yards from the front door and is ideal for beach combing, crabbing and skimming stones. We are in easy reach of surfing beaches at Polzeath and Watergate Bay as well as family beaches at Daymer Bay and Harlyn Bay. At low tide neighbouring Port Gaverne has a small, sheltered, sandy beach with rock pools, a perfect beach for small children. Newquay airport is 30 minutes drive with direct flights from fifteen destinations both in the UK and Europe. Car hire available at the airport. 70 mins drive from Exeter airport. 20 mins drive from Bodmin train station. Buses available to Wadebridge, Rock and Polzeath. Good train links from Newquay and Bodmin to London. Port Isaac is a working fishing village with fresh fish available daily from the harbour. Every Friday the now famous Fishermen’s Friends (a group of local residents inc three fisherman) sing acapela sea shanties and there are regular visits from the St Breward Brass Band on the Platt. Fishing trips and kayaking can be arranged from the beach. Booking Notes: 25% deposit on booking. Balance payable 8 weeks prior to arrival date. Full payment if booking within 8 weeks of arrival date. Contacts via email, phone or post, confirmations via email or post. Confirmation constitutes contract. Payable BACS electronic transfer preferred. If paying by cheque an additional £10 fee is added.. Full booking conditions including cancellation policy available on request. Sorry, no pets please. Changeover Day: Usual changeover day is Saturday but this can be flexible subject to availability.